Every once in awhile our family decides to go to a game store only to wind up spending hours playing puzzles games inside. 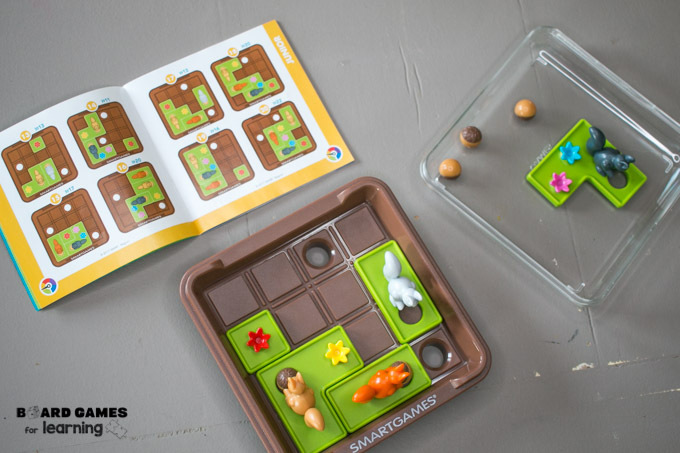 We just can’t help ourselves, so when we find any great strategy game for kids that adults can play too, it’s a win-win situation. 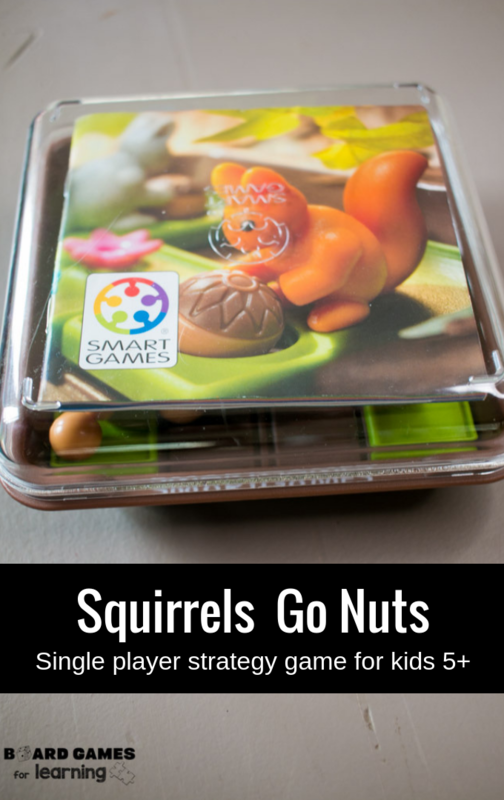 And Squirrels Go Nuts fits that description… better yet, it’s small and travel pretty well. We got this travel-sized game in July 2018 and it’s taken several trips in the van with us, but more importantly is a quick in-between kind of game. So we might be winding down before bedtime or have some downtime to wait in an office or fill in any scenario where a kid can focus on something for 15 minutes or more. It’s always a challenge to continue to go through the booklet and it’s a self-correcting game that I don’t have to oversee unless they’re so stuck that they want help. The ONE and only downside is that it’s tricky to get all the acorns to stay in the case and not drop through, so a carrying bag is helpful. ♦️Get a drawstring bag to ensure no nuts get lost in transport. Grit and determination make up one of those things that’s actually somewhat hard to teach. And of course, as the student, it’s even harder and more excruciating to learn. But self-correcting puzzle games where the only opponent is yourself and the only way to win is to get the one and only correct answer means kids can learn a lot about both strategy and persistence from brain teaser types of puzzles. My three year old loves puzzles, but if it’s too hard she often just solicits her older sister to help. What I like about this game is that, yes, you can still work together, but it’s small enough that it really should be done solo. So I can give my kids two different tasks to work on in order to allow them to correctly obtain the right sequence of moves to get each nut in the right hole. When Jenn, my 6 year old, was working through each puzzle in numerical order she was blazing through some and took a awhile for others. The time and patience it took to make she she dropped every piece into the correct place was character building as well as logic building for her. Of course puzzles teach logic, but one of the beautiful parts of this game is that the ball, or “nut”, simply will not drop into the hole if you don’t move the pieces correctly. Therefore not only is it teaching the strategy of what move to make, but also the ability to backtrack and think through mistakes! Just like any great puzzle game, you must solve for the answer from only the information provided. So just like you might set up a sudoku puzzle or build a marble maze, it all has to fit together correctly for it to work in an ideal manner. The game comes with a little booklet that allows each student, child, or adult to mimic the setup on their board. 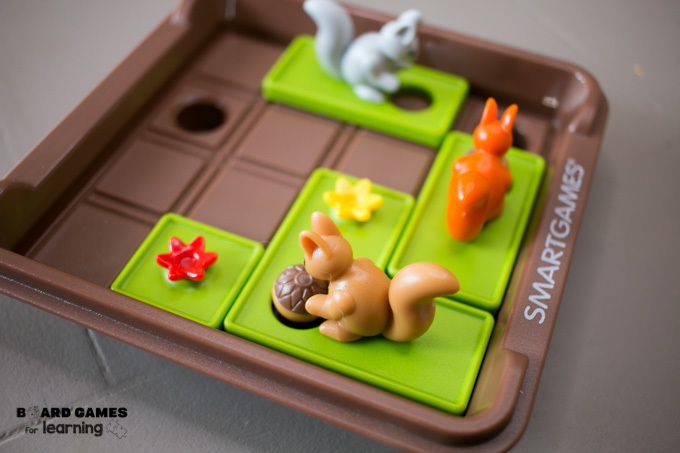 Then you have to put an acorn with each squirrel on the board, working to move them so that they bury their acorns. 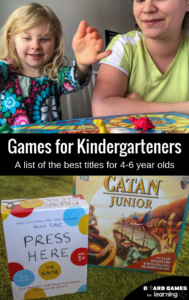 There’s only one right answer per puzzle and each one gets increasingly harder so it is in fact a great game for both children and adults… and you could even have a little friendly competition by using a timer or having a tournament. 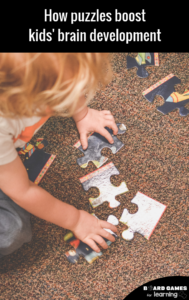 How to tell if your child or a student has a logical and mathematical learning style.